Where can I get assistance planning my travel in either English or Spanish? Simply call 855-POLKBUS (765-5287). Our customer service representatives will answer your questions in either language. Do you ever change your bus schedule? Yes, we continually evaluate our routes to be sure our scheduled stops are best serving the needs of the public. Decisions are made based on the Community Scorecard (see Home page for Community Scorecard information), which provides information on all runs for all routes regarding passengers, boardings and deboardings so a quality evaluation may be made before changes are instituted. Weekday hours of operation are 6:15 AM to 7:15 PM. Saturday hours are 7:15 AM to 6:15 PM. 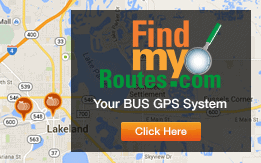 How do I find out if I live in the Lakeland Area Mass Transit District? You can click this link and type in your address in the search space. If you live in an apartment, just type in the address of the business office. For any further questions feel free to contact info@ridecitrus.com.